Osman Sagar Gandipet Lake in Hyderabad District in Telangana, Osman Sagar Gandipet Lake Hyderabad, Osman Sagar Gandipet Lake Entry Fee, Osman Sagar Gandipet Lake Timings: Osman Sagar is also known as Gandipet and it is a famous tourist spot and lake in Hyderabad. This dam was built in 1920 on the Musi River. Mainly this dam was built to provide extra drinking water facility to the people of Hyderabad. In 1908 Hyderabad was devastated because of the great Musi flood at that time. So Osman Ali Khan, Nizam at that time had ordered to construct this dam for the safety and benefit of the people. So in our article, Osman Sagar Gandipet Lake in Hyderabad District in Telangana we will describe this beautiful lake in detail with other relevant details. Also, you can read about Shamirpet Lake in Hyderabad District in Telangana. So these details will help you in planning your trip easily to either of these places. As you will get all the relevant details about Osman Sagar Gandipet Lake and Shamirpet Lake. As we know that this Osman Sagar Gandipet Lake was constructed in 1920 after the great flood in 1908 in Hyderabad. There is a house known as Sagar House which was built to look after the dam. Now, this lake is under Telangana tourism so they take care of this lake and the dam. Here you can see many parks, resorts, and amusement park. Osman Sagar Gandipet Lake has served people of Hyderabad for drinking water from a very long time and still serving. But now due to increased population, this is not sufficient to provide drinking water to all the people. 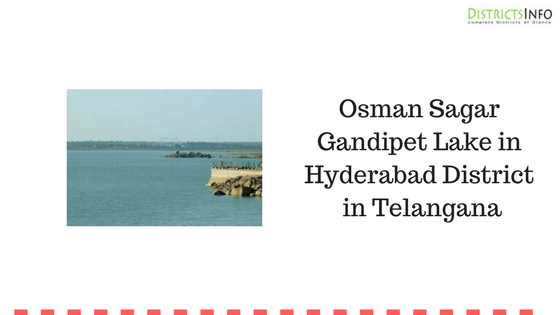 So in our article, Osman Sagar Gandipet Lake in Hyderabad District in Telangana you can check all the details about Osman Sagar Lake. Also, you can check the official link for related information about Osman Sagar. * Osman Sagar Gandipet Lake is located in outskirts of Hyderabad. From Nampally railway station this dam is about 22 km away. * This dam was built in 1920 during the reign of Nizam. The ruler at that time was Osman Ali Khan who ordered to build this dam for the safety of people of Hyderabad. 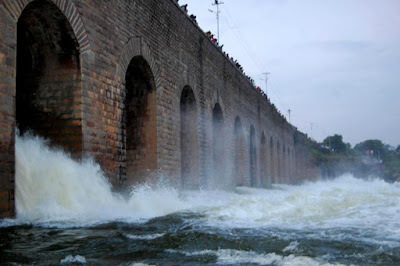 * After the great Musi flood in 1908 this dam was built in Hyderabad. * Main purpose of this dam was to provide drinking water to the people of Hyderabad and also for the safety from the flood. * From Nampally station in Hyderabad this dam is around 22 km and from Golkonda Fort it is about 11 km away. * Osman Sagar is also known as Gandipet Lake. * Boating, Swimming, etc. are available here. Also, you can see a building known as Sagar Mahal situated near the dam. * The nearest airport from Osman Sagar Gandipet Lake is in Hyderabad. And reaching Hyderabad is very easy these days as you can easily get a flight. * The nearest railway station from Osman Sagar Gandipet Lake is Nampally Railways station. It is just 22 km away from the station. From there you can get a can, auto, or taxi easily. * Reaching Hyderabad is very easy from anywhere in Telangana and other places. From there you can easily reach to Osman Sagar Gandipet Lake. Also, from Golconda Fort, this lake is just 11 km away. So this is all about Osman Sagar Gandipet Lake in Hyderabad District in Telangana. Now you have all the relevant information about this lake. Also, you can see Golkonda Fort in Hyderabad District in Telangana. As this is one of the nearest tourist places from Osman Sagar Gandipet Lake.